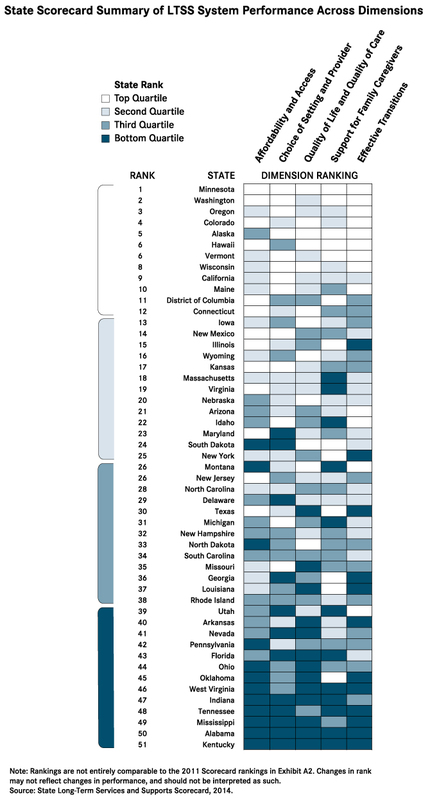 The quality and cost of long term care varies by state. If you’ve spent time planning for retirement, make sure to consider the possible impact that these costs will have on your hard-earned savings. Knowing how much long term care services would cost in the future is necessary in creating a plan. View the average cost of care of services in your area by clicking on your state on the map above. It’s important to understand that these costs are projected to only increase annually. Expect varying levels of quality of the different service providers depending on where you choose to retire. While overall quality is steadily improving, especially in states where there are public policies directly affecting long term care, the pace is slow when compared to the rate that more and more seniors enter advanced ages. The State Long-Term Services and Supports Scorecard Summary below shows each state’s relative performance across five dimensions: affordability and access, choice of setting and provider, quality of life and quality of care, support for family caregivers, and effective transitions. ACSIA Partners provides expert advice and assistance through its network of licensed long term care planning specialists all over the country. Feel free to request for more information on long term care in your area.